When Harry was born, I joined a new mom support group. At the time there were about a dozen moms and we all had babies about the same time. I stayed in touch with a good handful of them, and now since it’s been a year, it’s birthday party season. So I’ve got about five birthday parties to attend within about a month. And that’s not counting Harry’s party which is coming up in two weeks. Since we have lots of birthday parties to attend, I wanted to do something special for each one. But of course buying gifts isn’t always the most special thing to do. And I know Harry got a lot of Christmas gifts, so I don’t necessarily think that toys are with my friends need. 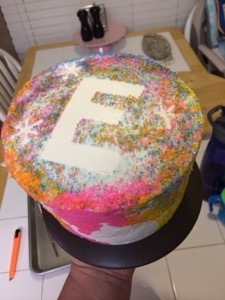 So I offered to make the smash cakes. And a couple of our friends took us up on it. 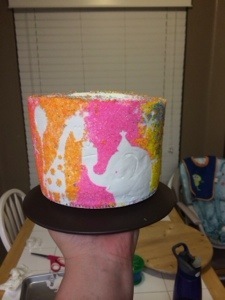 For the cake, I decided to use sprinkles. I made the cake with vanilla cake and vanilla buttercream because it’s the safest most mild cake flavors for a one-year-old to eat. I cut out some shapes using my Cricut and wax paper. I borrowed a cartridge from a friend of mine that has some really cute Safari birthday animals. Once the cake was frosted, I put the cut out shapes onto the frosting. And then the fun part! I put handfuls of sprinkles and just pressed them into the side of the cake. 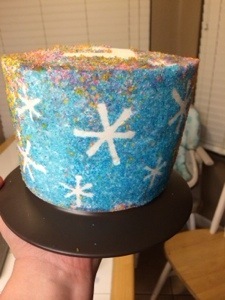 I used different colors around the sides, and then used a lot of the sprinkles that had fallen off on the top. 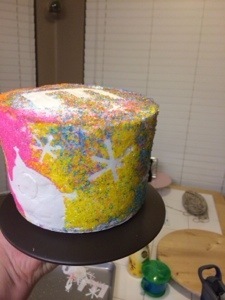 Once the cake was covered in sprinkles, I put it into the fridge to let the frosting set. Buttercream frosting can get really firm in the fridge, just like butter does. So I wanted the cake in the coldness of the fridge to get nice and firm before removing the wax paper. Once the frosting was firm, I simply peeled off the wax paper cutouts. And I was left with a beautiful white smooth spot where the wax paper had been. I took a knife to carve out the shape of an ear on the elephant and the eyes on the giraffe. I even added a little reflection in the balloon that’s tied to the dress tail. 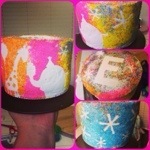 I was very pleased with the way the cake turned out, and I know that little Evey liked it too.